A blend of natural oils, lanolin, and silicone that preserves and lubricates leather items subjected to rugged outdoor use. Lanolin keeps leather pliant and silicone repels water. 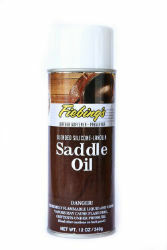 For use on saddlery, hunting boots, work shoes, and leather athletic goods.